Does the Second Amendment apply to state and local governments? The Supreme Court has not definitively ruled, but in Nordyke v. King, decided just before this issue of America’s 1st Freedom went to press, the Ninth Circuit Court of Appeals ruled that the Second Amendment does bind state and local governments. The Ninth Circuit covers the nine westernmost states, including California. All of the provisions of the Bill of Rights are direct restrictions on the federal government. Likewise, directly limited is an entity whose powers exist only because they were granted from the federal government. For example, under the Constitution, the federal government is in charge of the District of Columbia. The D.C. Council’s powers exist solely because Congress delegated to the Council some of Congress’ authority over the District. As the D.C. v. Heller case recently affirmed, the Second Amendment prohibits the federal government, and federal entities such as D.C., from banning handguns for self-defense. Under modern Supreme Court doctrine, the Fourteenth Amendment’s “due process” clause protects both “procedural” and “substantive” due process. Procedural due process involves the fairness of how the government acted; for example, before the government took away someone’s driver’s license, did the person have an opportunity to present his side of the story to a neutral decision-maker? Substantive due process involves what the government did. And some things that a government might do would involve an unjust deprivation of constitutional liberty, even if the procedures were fair. Suppose a state passed a law that said, “Anyone who reads a book criticizing the state’s governor will be imprisoned for one year.” And also suppose that for prosecutions under the law, there were all the usual procedural protections: that is, a defendant had a right to a jury trial; the defendant could cross-examine prosecution witnesses; the prosecution had to prove beyond a reasonable doubt that the defendant really had read the book; and so on. Even with all the procedural protections in place (procedural due process), the law would be a violation of the Fourteenth Amendment because there are just some ways in which a government may never deprive a person of liberty (substantive due process). How does this affect the Bill of Rights? The Supreme Court has ruled that some, but not all, of the provisions of the Bill of Rights are “incorporated” in the Fourteenth Amendment’s due process clause. The incorporated provisions of the Bill of Rights are thereby made enforceable against state governments. They’re also enforceable against local governments, since local governments’ powers are derived from the state. Most of the Supreme Court’s cases on Fourteenth Amendment incorporation were decided between the 1930s and the 1960s. By the time the court was done, almost all of the provisions in the Bill of Rights had been incorporated, except: the Second Amendment right to arms; the Third Amendment right not to have soldiers quartered in one’s home; and the Fifth Amendment right to a grand jury indictment before being prosecuted. Also incorporated, of course, is the Tenth Amendment, which affirms that the people and the states retain powers not granted to the federal government. 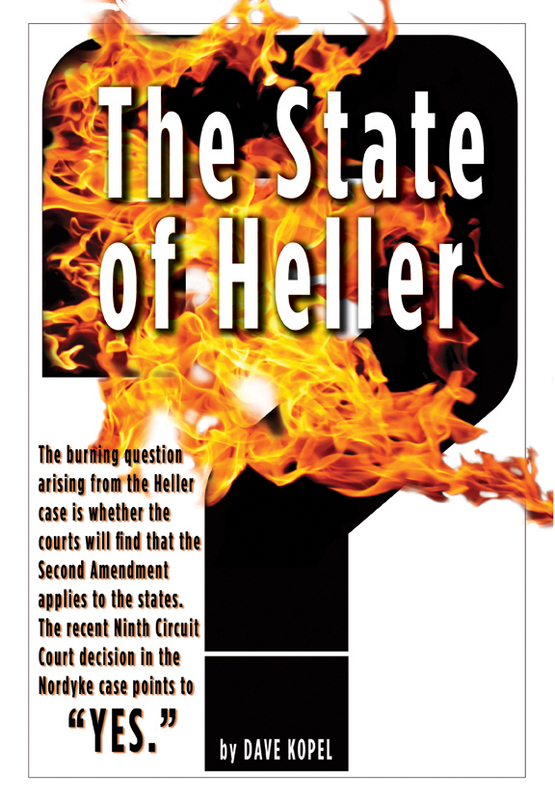 So once Heller definitively affirmed that the Second Amendment protects the individual rights of ordinary citizens, the next question was whether the Second Amendment applies to state and local governments. There are some old cases from the 19th century suggesting that it does not, but those involved another provision of the Fourteenth Amendment (the “privileges or immunities” clause), not the due process clause. However, the question will not be definitively resolved until the U.S. Supreme Court issues a decision. From the pro-rights perspective, the sooner the Supreme Court takes a Second Amendment incorporation case, the better, since President Barack Obama’s Supreme Court nominees are unlikely to look favorably on the Second Amendment. The Nordyke family, which promotes gun shows throughout California, sued. Their lead lawyer is Donald Kilmer, a California attorney with extensive experience in gun law cases. He has been assisted by Don Kates, a Washington state lawyer with a very long and eminent record of Second Amendment scholarship and litigation. After many twists and turns, the Nordyke case was argued before a three-judge panel of the Ninth Circuit in January 2009. The panel consisted of Circuit Judges Arthur L. Alarcón (appointed by President Carter in 1979), Diarmuid F. O’Scannlain (Reagan, 1986) and Ronald M. Gould (Clinton, 1999). An amicus (friend of the court) brief on behalf of the NRA and the California Rifle & Pistol Association was filed by Chuck Michel of California and Stephen Halbrook of Virginia.